Winter has descended up here in Ryedale, and although the temperature frequently dips below zero in a morning, the work goes on. 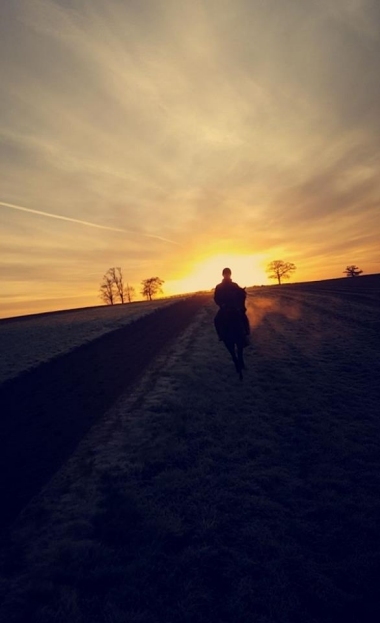 At this time of year training continues with the National Hunt horses, but with the rapid expansion of all weather racing our flat horses have many more opportunities and many stay in training beyond the traditional end of the turf flat season. The new tapeta track at Newcastle is just up the road, and we have become regulars at Chelmsford City where our strike rate is very good indeed! The longer flat season means that owners get many more chances to see their racehorses, and they can run right through them winter. This means the horses need their exercise all year round and here we have some pictures of our winter regime. Of course much of our time is also spent with the yearlings as they approach their second birthday and are already getting ready for the new flat season in 2017. Here at Mick Easterby Racing the work never stops! 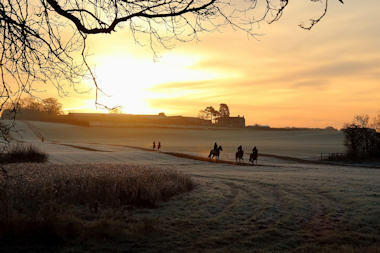 A magnificent photo taken by Megan Nicholls as she heads back down the gallop followed by Harrison Shaw. 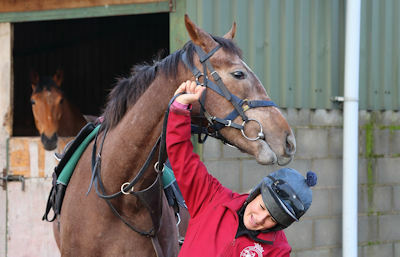 Caroline Bartram is at the yard this morning exercising the jumpers. After a fabulous season Hoofalong is in the warmth of the barn having his winter break, alongside Perfect Pasture and Kalk Bay. Joanna reports back to Alan and Gary how their horse worked this morning. He is looking good. After exercise Joanna takes her horse back to his box. Half sister of Bowson Fred, this filly out of Bow Bridge shows that fun and frolics run in the family. Bowson Fred is his entertaining self! 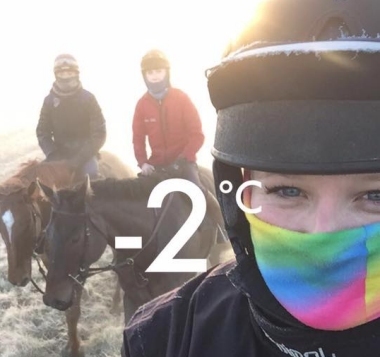 Riding out and its minus two this morning, best to keep well wrapped up. Joanna, Nathan and Harrison wrapped up with their scarves keeping out the icy blast.